"Winter may have ended, but the dangers have not." The DVD Review and Extras Review are by Jon Danziger. We're always so eager to anthropomorphize animals, to our and their detriment�no, actually, they're not exactly like us, and what we perceive as cute and cuddly may not be that way at all. (Koalas would be Exhibit A here�they've got teddy bear faces, but they're really rather unpleasant little things.) Penguins seem to be a great favorite, too, on this score�perhaps it's their black-and-white coloring, reminiscent of formal wear, or the odd little waddle and their lack of aerodynamic design, but be they my old childhood friend Tennessee Tuxedo or the quartet of rapscallions up to no good in Madagascar, penguins are everyone's favorites. The crowds at zoos and aquaria bear this out as well. I was most pleased to discover, then, that this documentary treats the penguins on their own terms, and doesn't really try to turn them into funny little people. Even more extraordinary is the technical accomplishment of the filmmaking here�the crew spent a year following a group of penguins who live near the South Pole, and the shooting conditions had to be relentlessly freezing and punishing. The result is an only occasionally dewy look at the lives of the emperor penguins, one that is about little more than survival and procreation, making this a case study in the rigors of Darwinian natural selection. The numbers alone tell much of the story�the narration track reports that the average temperature is 58 degrees below zero, and that their life cycle demands that some penguins go as long as 125 days without food, during which time they may lose as much as half of their body weight. 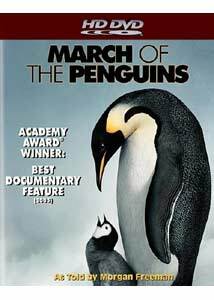 But this movie wasn't a sensation because of the numbers�it's the penguins' relentless pursuit of survival, their fortitude and adaptability, and their highest priority being the successful hatching of their chicks that are so ably illustrated here. Some of the vistas are gorgeous, and some of the facts of the penguins' habits strike us as particularly unusual. (It's the fathers, for instance, who nurse the penguin eggs, keeping them warm, while the mothers take the typically male role of hunter-gatherers.) Inevitably, some of the mating is unsuccessful—eggs are lost to the cold; predators make short work of both adults and chicks; some of the older members of the tribe lack the heartiness to make it through another winter. And deeply fascinating, too, is the group's enforcement of its social codes�when one mother loses her baby to the elements, for instance, she attempts to steal another mother's chick, but is soon beaten back by other members of the tribe. More generally, the movie challenges us to expand our notions of behavior that is recognizably but exclusively human, for we see the penguins nuzzling, crying, sacrificing and mourning, displaying a degree of awareness and intelligence that we don't frequently ascribe to other species, but probably should. Morgan Freeman narrates in a track that sometimes overdoes it a little; you could say the same for the musical scoring, heavy on the violins. But on their own terms, the penguins' year is a rough and fascinating one, the only life they know and will ever know, where survival itself is the only goal worth pursuing. And as a documentary, it's a pretty remarkable technical achievement, one that will fascinate you and have you reaching for your winter coat. Image Transfer Review: For those who might be expecting the clarity of a Discovery Channel HD documentary, this picture is bound to disappoint. It's lacking in fine detail for much of its running time, possibly due to the need to use telephoto for much of the photography. It's quite soft as well, and edge enhancement is applied in several spots in a misguided attempt to add clarity. Detail is most satisfactory in the extreme closeups of feathers, especially on the fuzzy little chicks. The main advantage over the standard DVD is the much superior rendering of the frequently heavy grain structure. For the most part it looks film-like, even in the computer-generated segments, which blend pretty seamlessly into the nature photography. Audio Transfer Review: The audio is fairly serviceable, with Morgan Freeman's narration coming across with gentleness and subtleties. The primary impact is during the storm sequences, when the wind whipping through the home theater will induce more than a little of a chill. Extras Review: The extras are identical to those on the standard DVD release. Only the cartoon is presented in HD. Unlike most HD DVDs from Warner, there is no French subtitle track. Two accompanying documentaries give us good long looks at just how this film was made. Of Penguins and Men (53m:43s) focuses on the film crew, and how they established protocol with the birds�it's an amazing undertaking, just surviving there for all that time, and keeping their equipment functioning in the Antarctic, not exactly a studio backlot. National Geographic's Critter-Cam: Emperor Penguins (23m:30s) offers many additional facts about the stars of our show, and demonstrates how cameras were strapped on to some of them for some penguin P.O.V. action. Finally, as this is a Warner Bros. release, Bugs gets in on the action with a penguin pal in 8 Ball Bunny—dOc completists will note that this same animated short accompanies the DVD release of The Treasure of the Sierra Madre. But it's here in glorious high definition, and it looks marvelous. The filmmakers have taken the rather conventional year-in-the-life approach, but their forbearance under extraordinary conditions and the majestic quality to the instincts and survival skills of the emperor penguins make this frequently fascinating viewing, especially for those who have developed a taste for the programming on Animal Planet.